KISS was recently inducted into the Rock ’N’ Roll Hall of Fame after forty years of hard work, blood, sweat, and tears. Unlike other bands, not all of their current and former associates were asked to share the honor. The Hall of Fame only awarded original members Paul Stanley, Gene Simmons, Ace Frehley, and Peter Criss in the ceremony which took place on April 10, 2014. Paul Stanley and Gene Simmons were enraged by the Rock ’N’ Roll Hall of Fame’s decision and refused to perform at the event. How could thirty years of hit records and songs still being played in their concert sets just be ignored? Not only were the two founding members of KISS irritated by this, but many fans of the band’s music past their early makeup days were as well. We’ve heard from the original four founders of KISS in regards to how they feel about their induction into the Rock ’N’ Roll Hall of Fame through countless publications and online blogs. However, what do the former members of the band think about being ignored by the institution? Two of the group’s previous warriors from the 1980s and 1990s are no longer with us. ”Animalize” lead guitarist Mark St. John passed away in 2007. Drummer Eric Carr lost his battle with heart cancer in 1991. He wrote and performed with KISS from 1981 to 1991. Carr replaced Peter Criss and donned fox makeup for his stage persona. Besides Vinnie Vincent, that leaves only one other member not recognized by the Rock ’N’ Roll Hall of Fame. Former KISS lead guitarist Bruce Kulick joined the band in 1984 and collaborated with them until 1996. In his twelve years with the band, he recorded five studio albums and two live records. The reunited four members of KISS and the current incarnation played ”Tears are Falling,” ”Crazy, Crazy Nights,” and ”Unholy.” These are all songs Kulick played lead guitar on and contributed to. I caught up with Bruce Kulick after the Rock ’N’ Roll Hall of Fame and thought KISS fans might be interested in his take on the induction and how he feels to see the band recognized by receiving such a prestigious award. He was more than happy to share his emotions and reactions. It’s such a great honor to be a part of a band that’s as legendary as KISS. I asked Kulick to share with me how that excitement runs through your veins. ”It has been a roller-coaster ride for me emotionally from the day it was announced KISS was finally being inducted. Would I be included or forgotten? Will I get to play? How will the originals deal with each other? I feel elated about the entire affair now that it is done and I got my due respect from the podium being mentioned three times,” the lead guitarist proclaimed. Previous personnel from other bands have been inducted into the Rock ’N’ Roll Hall of Fame alongside their founding members. Kulick shared his view on the exclusion of KISS alumni. Paul Stanley, Gene Simmons, Ace Frehley, and Peter Criss all took the stage on April 10 and were allowed to say thanks to their fans and families. I was curious as to what Bruce Kulick’s acceptance speech would sound like. ”I really don’t know! I know besides thanking my family, friends and the fans I would say when I was doing my thing in the group those twelve years, looking back, I didn’t realize how important it truly was in the big picture of this amazing band. I am very grateful I did my best,” he replied. 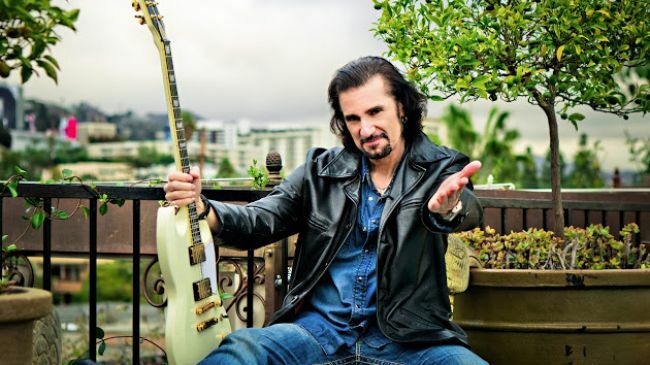 Bruce Kulick is an important part of KISStory and has gone on to play in Grand Funk Railroad, Union, ESP (Eric Singer Project), and the solo albums of both Paul Stanley and Gene Simmons. There’s no denying the impact he had on KISS’s music and their stage presence in the 1980s and 1990s. In closing, I asked Kulick what he considered his biggest achievement to be while playing with the band.